You can actually see this for yourself on the Mall. Oh, PETA. There's nothing they won't do for a bit of attention. But this time, instead of scantily clad women or horrifying photos... they've recreated the last supper with famous vegetarians, instead of apostles. OK, better now? But wait, there's more! The exhibit is housed inside a 28-foot 1955 Airstream chrome diner. 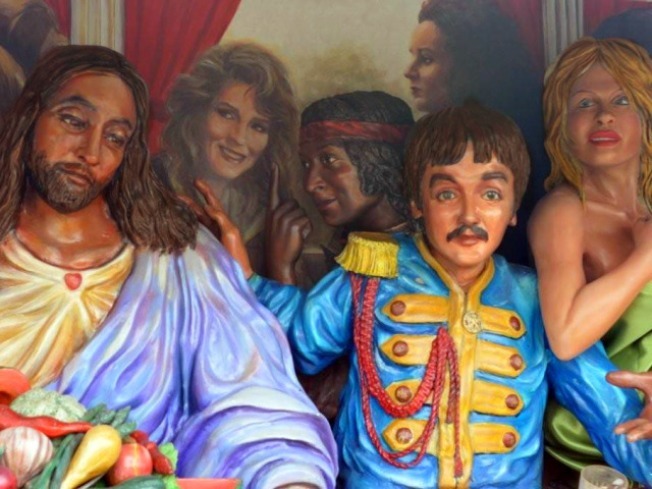 The sides of the diner flip up to reveal the 3D last supper -- and guests include Paul McCartney, Pamela Anderson and Gandhi. Yes, Pam Anderson, and Gandhi. We'd love to think up something funny to say, except this stuff just writes itself. Some biblical scholars contend that because Jesus was an Essene—a member of a Jewish sect that forbade animal sacrifice and meat-eating—he was likely vegetarian. Passersby—including families visiting the Smithsonian Institution will find lots of food for thought at the exhibit. Tourists can peer into the windows on the opposite side of the trailer to view vivid sculptures depicting scenes of factory-farm cruelty and human gluttony. The Diner is now on display at the intersection of 14th Street S.W. and Jefferson Drive S.W. from 10 a.m.–4 p.m. through June 6.